One of the purposes of the Louix Dor Dempriey Foundation is to provide support to local communities, individuals, and organizations. On May 28th, several people from the Sundara Aravinda Ashram community spent the morning in Skye, a rural town just outside of Melbourne, helping a lady named Pam. For the past five years, this amazingly selfless woman has devoted her time and resources to caring for more than 20 ponies and horses, 13 of which have been surrendered by their owners, unwanted or neglected. She brings them onto her 20-acre property, cares for them, feeds them, and provides the medical and healing support they need to return to full health. 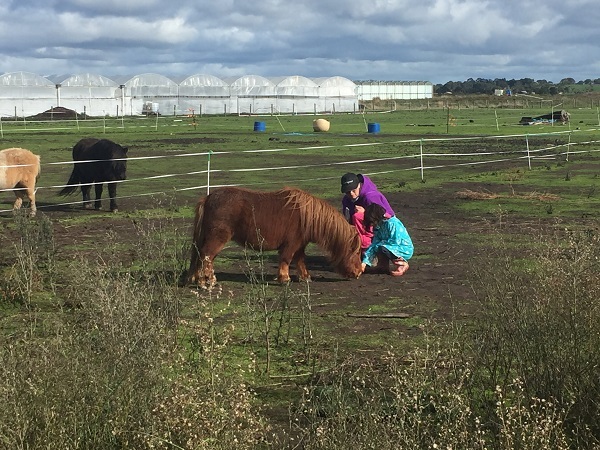 A group of 7, including 5-year-old Aliyah Rose, arrived at Pam’s property at around 10 a.m. and spent the next several hours pulling weeds from around the fence lines, helping her fix broken fences, and spending one-on-one time with several of the ponies. Food was also prepared, and Aliyah helped Pam to feed several of the ponies. Pam has had horses and ponies all of her adult life, and in 2012 had the capacity to provide a permanent home for unwanted equines. She relies on her own personal savings to pay for the care and rehabilitation of these horses. They range in age from 3 to 24 years, and include Shetlands, Miniatures, Welsh Mountain Ponies, and Thoroughbreds. Many of them came to her with behavioural issues; some had never been handled, and most were very wary of people. Pam appreciates the support that our ashram community has provided thus far. She has commented how comfortable the horses are with our group—she believes that the loving presence of the group helps restore their faith in people. This was the second time the Sundara Aravinda community has assisted Pam and her ponies, and we will continue to support this very worthy cause.